Welcome to the Moama Lions Club. The Lions Club of Moama NSW Inc is a non-profit, volunteer, service club. We are ordinary people doing extraordinary work and we enjoy fun and fellowship. Moama was settled in 1845 when it was known as Maiden's Punt named after James Maiden. In 1851 the town was renamed Moama. Moama is a fast growing town and a popular tourist and holiday destination. 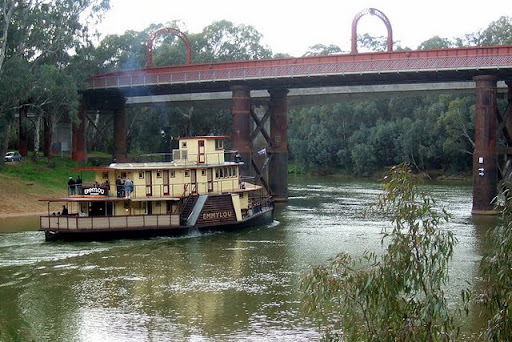 There are lots of attractions, the most famous one of course the paddlesteamers which leave from Echuca, on the other side of the mighty Murray River. This is also a great grape growing area with several wineries offering cellar door sales. There are several Clubs in Moama offering the locals and visitors a round of golf, a game of bowls, live entertainment and excellent meals. Moama is also the start of the The Long Paddock. This is the colloquial term for the stock routes that cross Australia - open strecthes of unfenced land that anyone can use to move stock or feed in times of drought. The Long Paddock â€“ Cobb Highway touring route follows the length of the Cobb Highway (610 km) from Echuca Moama on the Victorian border through to Wilcannia in the north. The weather is great, it is said that Echuca Moama has more sunny days than Queensland's Gold Coast.